The victory of Donald Trump in the US elections 2016 consisted of many components. But one of the main ones was Stephen Bannon who had allowed Donald Trump to not only become president but also influence the entire brand of the US as a state. Building the brand is a separate important component in sports neuromarketing, so negative examples serve as an opportunity to understand the situation clearly. Ruling many complications out, what is fundamentally important for understanding the work on the brand? Certainly, it’s the somatic marker hypothesis. Its essence can be described quite simply – our brain creates a certain somatic (emotional) marker in response to every experience we get in life. This is done in order to conserve brain energy; and when we have the choice to repeat some experience, our brain simply “pulls out” the right somatic (emotional) marker. Here is how it was in the process of evolution: our ancestors ate something, and that made them sick; the next time they were going to eat the same, their somatic marker created an emotion of disgust. Now, these markers are responsible for almost every decision we make, even a complex one, which, as we think, we make logically. It is the reason why it is extremely important to ensure that you don’t create negative somatic (emotional) markers around your brand and reputation. At the end of the article, we’ll talk some more about the impact of various factors on the brand, but first, let’s talk about the situation with the US brand. What has happened to the US since the beginning of Donald Trump’s presidency? What did Stephen Bannon eventually do to the US brand? Do you remember the times when the US flag fitted perfectly into the pop culture? It was particularly exploited by Lana Del Rey. I’m not going to have the American flag waving while I’m singing ‘Born to Die.’ It’s not going to happen. I’d rather have static. I think it would be inappropriate to be in France with an American flag. It would feel weird to me now – it didn’t feel weird in 2013. It wasn’t weird in 2013, but it became weird in 2017. It’s not just weird but it positions the performer not in a good way. Not surprisingly, Lana Del Rey decided to abandon the symbol of some bold freedom that the US flag was associated with in 2013. Donald Trump’s problems with Stephen Bannon began shortly after Trump was elected president. On the one hand, Bannon was still the key to Trump’s target audience, but on the other, all the merits began to be shifted to Bannon. It came as no surprise that Trump had removed Bannon from his immediate circle. Nevertheless, Trump soon had to get him back because of Bannon being close to understanding the target audience. However, the problems continued, because Bannon’s ideology cost him numerous enemies among Donald Trump’s entourage. But considering this, Stephen Bannon has managed to exert a significant negative impact on the US brand. Placing on public display the idea of the US and its symbols which is characteristic of not the most progressive population segments, Bannon has actually devalued the state’s brand. The US brand became uninteresting for the solvent population segment, as it began to be firmly associated with the ignorant people of the American outback. I consider it an obvious PR failure when people start joking about the topic in comedy shows. 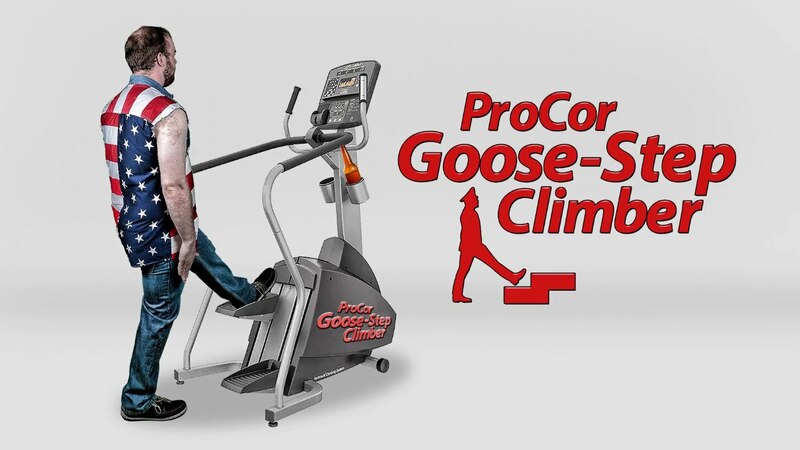 For example, here is a parody of companies with a Nazi reference in Conan O’Brien show. In this case, one does not even need to comment. It is a complete collapse of the brand. At the same time, they began to joke about Steve Bannon himself. 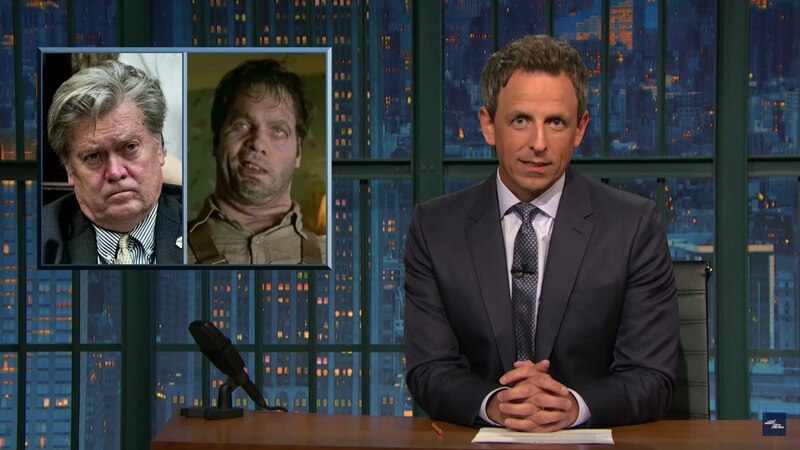 It’s quite a tough satire from Seth Meyers. The comparison of Bannon with a character from Men in Black. Even by Donald Trump’s standards, there is a bad publicity. They decided to leave the negative PR around Bannon with him, getting rid of him finally, as a public person at least. But it still won’t help the US brand. It has irrevocably become a white trash possession. 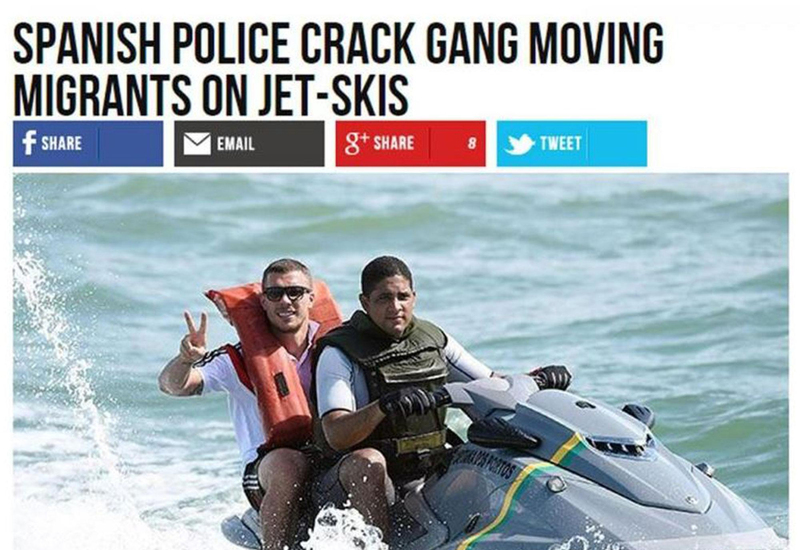 It is especially noteworthy that as soon as it became known about Stephen Bannon’s return to Breitbart News, that resource issued an explosive “fake news” in which, while talking about the transportation of illegal migrants from Morocco to Spain by jet skis, it attached a photo of Lucas Podolski, one of the brightest players in the history of the German national football team. This is all you need to know to understand the level Bannon has brought the US brand to. Especially in light of the fact that some called him Trump’s “brain”. Although Vox insists on a simple similarity of Bannon and Trump’s beliefs, that doesn’t change the situation much. My regular readers know how neuromarketing explains the brand’s importance. You can find more details on this in my articles on sales motivation and the insula’s decreased activation which is negatively correlated with the probability of purchase. It is that very part of the brain which plays an important role in the perception of pain. In short, the purchase is made if the brain considers the balance between the reward and “pain” acceptable. And it is the brand from different points of view that becomes the main factor of a purchase. I mean, today, the importance of a brand is not just an assumption of old marketing but is something we understand quite accurately due to neuromarketing. Politics continues to be a show business for ugly people, therefore, strangely enough, it is in politics that constant unconscious experiments on the solidity of personal brands are obvious, whereas, in professional sports, one is given a minimal right to mistake. As long as an athlete treats his personal brand with respect and intelligence, he will be able to profit from it even after completing his professional career. Now we see on the example of the UFC that the sports component fully departs from professional sports. The personal brand becomes fundamental. An athlete’s qualitative brand will gather a wide audience, whereas his/her sports skill will be interesting primarily to professionals. The rest of the sport is moving in the same direction. It is doing it slower, but no one has a choice. In the context of this, it is especially important to understand the influence of various factors on the brand. 1. Media. Whether your brand is a personal one, the brand of a company or even the whole state, you need to observe at least an elementary respectful relationship with the media. Media representatives can be different, like media itself these days. Coverage of the blogger who conducts his activities through different platforms can be much higher and more influential than the coverage and impact of a publication with a staff. Bad relations with the media will result in negative coverage, which will negatively affect the brand. The athlete will not be able to sign good contracts with high-quality sponsors, the company’s products or services will not be in demand, and people will treat the state badly and try to leave it. 2. Relations with rivals. Rivalry with someone does not mean a bad relationship. On the one hand, a bad relationship with a certain rival can position you toward a particular audience. However, in this case, you will be interesting either to the brands also relying exclusively on this audience, or the brands of a not very high level (which surely affects their solvency). So, if you play the long game and have high expectations and goals in relation to your personal brand, you need to take the factor of relations with your rivals very seriously. At the same time, decent behavior toward your rivals has one more distinctive feature that exerts an additional positive influence on your brand in the perception of the target audience. The study of scientists from Oakland University makes it clear that demonstrating respect for the opponent can have a hidden motive. In the case of fighters, respect after the fight is demonstrated only in a situation when the opponent is smaller and did not use “dirty” techniques. That is when the winning fighter considers the loser much weaker. This serves as a definite contribution to the relations within the group. 3. Self-education. There should be something real behind any quality work on the brand building. If the positioning of the brand resonates with the personality of the athlete or the company’s founder who becomes its public face, it greatly simplifies the work, increases the probability of success, and positively affects the person himself/herself. But what can the brand be built on if the person himself does not hurry to develop beyond his/her profession? Especially in our days, when, on the one hand, professional activity is getting narrower and deeper, but on the other – it gets blurred when you want to achieve something more. Sports psychologists believe that at a certain stage of the athlete’s development, an excessive analysis of his/her actions can hinder him/her. At the same time, if you can at least occasionally switch to something else which will be your useful hobby, it will also be able to bring positive results, as you can mentally relax. I have already described the situation when David Beckham, who serves as a perfect illustration of the previous point, failed to answer the simplest creative question from the audience on James Corden’s show. I felt sorry for David at that moment. However, this would not have happened if Beckham had put more effort into self-education. An interesting personality always has additional advantages, as he/she is appealing and gravitated to. But you won’t become such a person without a craving for knowledge. Do you want to get a detailed consultation or order the development of a detailed brand book based on neuromarketing and behavioral economics with our help in its implementation and subsequent support from professionals? Write to me at Email leon@sportsneuromarketing.com, and you will receive my response within twenty-four hours.